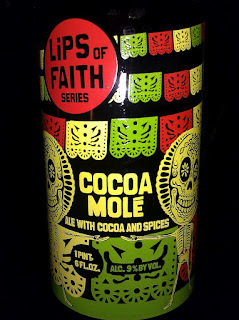 New Belgium has a new beer in their Lips of Faith series that may have you exclaiming, ""Arriba! abajo! al centro! y pa'dentro!". Cocoa Mole is a 9% ABV beer brewed with multiple chocolate malts and boasts the addition of cocoa and cinnamon. New Belgium adds south of the border heat (not the tourist trap South of the Border in South Carolina, but the south of the border where they sell cheap drugs) with ancho, guajillo, and chipotle peppers. This is sure to be a beer you will remember, which is more than you can say about your last visit to Juarez. Jubilation has this for $9.99 per 22 oz. bottle.